Hawthorn is the first tree of the second aicme, group of five, in the Ogham. Huathe, the hawthorn, is the tree of the otherworld. It is one of the three trees that make up the “fairy triad”, along with the ash and the oak. It is believed that the fairy realm can be directly accessed through this tree, especially when it is flowering and with greatest of ease at Beltane, which is the beginning of the light half of the year. 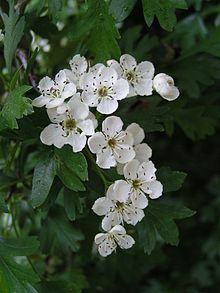 Huathe, hawthorn or whitethorn, is the tree of May, which is the month of chastity and restraint. So it is that the Otherworld can be accessed more easily by those who are pure of heart, which are those who can access a childlike nature of open mindedness and playfulness. Many people associate Huathe with ill fortune and bad luck. It is a tree of great potential and has the power to unlock the mysteries of other kingdoms. It is more likely that the hawthorn has a nature that reeks of caution to the uninitiated than it is actually “bad luck”. It is still believed in many parts of the old country that chopping down a hawthorn will bring one ruin, as the protective spirits can be vindictive and vengeful. For this reason it is also a tree that is sometimes sought out by those who practice the darker arts. Like the birch, the hawthorn’s meanings and associations are agreed upon to a large degree[i]. Its powers however seem to defy explanation and are left for the practitioner to experience for themselves, with a thinly veiled warning from those that have gone before. Ballyvadlea Ireland set the stage for a grim series of events in March of 1895. It had been reported to the local constabulary that Bridget Cleary, wife to Michael Cleary, was missing by a concerned friend. An inquiry became an investigation, which eventually revealed a burnt body in a shallow grave. Nine people were initially charged for the murder while other people in the village were later revealed to have been aware of the events that had transpired, or to have been participants in the actual killing. This included Bridget’s husband, her father, her cousins, and her neighbours. The motive for the crime-which is sometimes inaccurately described as the last witch burning of Ireland- was found to have been one in which the townsfolk believed that they were torturing a changeling (a shapeshifting fairy imposter) and were only trying to retrieve Bridget back from the fairies. Michael Cleary is said to have stated that his wife was two inches too tall and much too fair or beautiful to have been her at all. The rest of the townsfolk seemed to agree in his assessment as they either participated in, or were accomplices to, the murder. Eventually Michael Cleary served 15 years for the killing. The case at the time was highly political. The English used the murder as proof that the Irish could not govern themselves because of their whimsical and uncivilized beliefs. The murder became international news, is said to have influenced Gerald Gardner – the modern father of Wiccanism- and has since been the source of several books and movies[ii]. Fairy abduction has been reported in myth and legend since the earliest of times. A well documented case in 1646 was that of Anne Jefferies in St. Teath England. After her reported abduction – which she did not like to talk about- she apparently had the powers of clairvoyance, did not need to eat, and had the power to heal. Thomas the Rhymer who lived from 1220-1298 in Scotland was also said to have disappeared for a time and to have returned with powers. This was later explained away as him having been with the fairies, most especially one which was his “fairy bride”. He became a noted bard and also had prophetic skills, even accurately predicting events such as the death of Alexander the 3rd. Katherine Mary Briggs’ Encyclopedia of Fairies is a good place to start exploring the phenomena of fairy encounters. This well researched text references over one hundred books and historical documents and discusses the two cases above alongside many others. While there are many different theories as to the source of these encounters-from mental illness to communion with demons- Briggs suggests that fairies may be categorized as either “diminished gods or the dead”. It is easy to dismiss these early encounters as fanciful and unlikely but the phenomenon continues to exist today only in an altered form. Alien abductions are believed to occur by many people. It is a common belief today that we are visited by beings from other planets for a variety of theorized reasons. Whatever one chooses to believe, whether it is a type of mental illness or a genuine phenomenon, perhaps the beings involved are one and the same. The Anne Jefferies account of 1646 describes her being approached by small humanoids, a pricking sensation before everything went black, and a sensation of being taken through the air. When she awoke the humanoids were her size and a fight ensued between the being who wanted to keep her (with the red feather) and the others who decided she could not stay. When it was determined that she had to be returned there was a pricking sensation once more before darkness returned and she was brought back to the land of the living. The fairies of Ireland are the Sidhe, or the Tuatha De Danann. The Tuatha De Danaan are often described as having arrived in “flying ships” to take Ireland by force from its previous owners the Fir Bolg. Ireland was then taken away from them by the ancestors of present Ireland, the Milesians, led by the great poet Amergin. The Tuatha De Danann went underground and became the Sidhe, or fairies. Even today there are crop circles found around the globe that self proclaimed hoaxers are unable to duplicate, scientists are unable to explain, and that continue to defy logic. 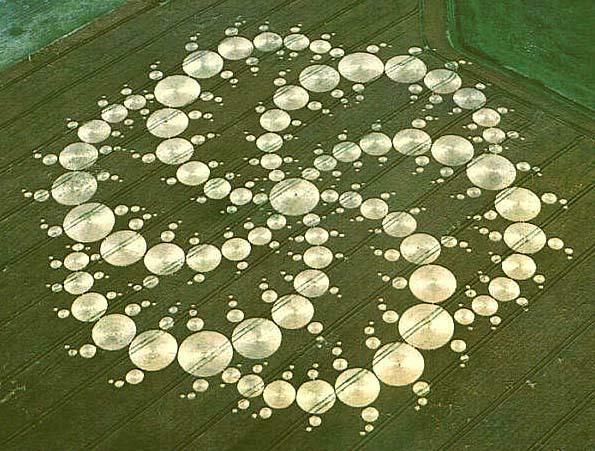 Although the most common theory seems to be alien communication, some call these findings “fairy circles”[iv]. Perhaps, whatever they are, even if there is a simple psychological explanation, aliens and fairies are the same thing. It is the hawthorn -and its association with the fairies- that makes us pause and consider these possibilities-and perhaps many more- during our symbolic journey. The hawthorn is also associated with the mythical goddess figure of Olwen who is found in the Mabinogion[v]. She is the daughter of Yspaddaden Penkawr, the chief giant hawthorn[vi]. It is said that her footprints produce white trefoil, or sometimes hawthorn flower petals, and that this is the origin of the Milky Way (Hageneder). Diminished gods, the dead, or something else altogether? The wolf is often associated with the hawthorn. The Ogham Tract found in the Book of Ballymote says that a pack of wolves is like the thorns of the hawthorn. “A terror to anyone is a pack of wolves”. Like the hawthorn and the fairy, the wolf is a creature that we cannot decide if we love or hate. In folklore and mythology it is either noble, or a menace. Like the alleged changeling of Bridget Cleary or the beautiful bride of Thomas the Rhymer the wolf is also seen as either a powerful enemy or a beneficial and otherworldly friend. The hawthorn with her beautiful and mystical flower masks a thorn with wound inflicting capabilities. The fairy with its magical allure and gifts of power, also promises madness and even death. The wolf offers us faithfulness, intuition, community, monogamy, strength, night vision, and the instinctual ability to hunt and to survive [vii]. It also can be viciously savage, steal livestock and has been known in times of hunger – although rare- to attack humans. While it is easy to see anything as either good or bad the truth is that there is nothing in nature that is so black or white. The fears of our ancestors hunted the wolf to extinction in many places. The last wolf in Scotland was killed in 1743 and the wolf was killed out of fear to the point of being endangered-and sometimes extinct- in many parts of North America. The reintroduction of wolves in Yellowstone Park and the recolonization of wolves in Glacier Park has been closely monitored and studied by scientists. It has been observed that elk and coyote populations dropped as elk herds were forced to stay on the move and the coyote suddenly had a natural enemy, vegetation stabilized on shorelines, aspen and willow trees thrived, many insect eating birds returned, overhanging branches of stabilized trees fed trout-which returned-, eagles and ravens also flourished and beavers returned. The entire watershed became healthier in just a couple of decades all from the reintroduction of a single-often villainized- species[viii]. We cannot afford to minimize or glorify any species on our journey through the forest. A clear perception is needed, braided with a healthy dose of respect. The fairy folk are seen as beautiful as they are terrible but perhaps they are something in between. The wolf is wild, intelligent and free, yet it is the bringer of nightmares and often associated with evil. It is believed by the Nordic ancestors that the Fenris wolf, the devourer of worlds, will bring about the destruction of all there is. The truth is that the wolf too is more likely to exist somewhere between the two extremes of good and evil. The hawthorn, or Huathe, is the bringer both of good luck and of bad. Hawthorn is the beauty with the thorns. She reminds us that perceptions can shift, and that awareness- with a healthy dose of caution- can make her an ally, as opposed to a tree that should be feared by the weak of heart. [i] The exception may be Erynn Rowan Laurie who links the concepts of loneliness, misfortune, nightmares, war, anxiety and many others to Huathe. Laurie reminds us that behind challenge is growth, or opportunity, however. She relates the Ogham letters as concepts or energies – akin to the Norse runes- and not necessarily representative of particular trees which accounts largely for her differing interpretation of the huathe from Graves, Pennick, Liz and Colin Murray, Greer, Hageneder, Cooper, and Farmer-Knowles. [iii] For references to the above statements, and one theory shared by some, see the documentary series Ancient Aliens on the History Channel. The series contains many thought provoking statements from various scientists and scholars that cannot be easily dismissed. It seems to lack counter arguments for many of the points discussed however. [vi] Yspaddaden is often believed to be a corruption of Ysbydd, hawthorn. [vii] The Druid Animal Oracle. Phillip and Stephanie Carr Gomm. This entry was posted in Tree Ogham and tagged Alien Abduction, Amergin, Ancient Aliens, Anne Jefferies, Balance of Nature, Book of Ballymote, Bridget Cleary, Changling, Crop Circles, Encyclopedia of Fairies, Fairy Abduction, Fire in the Head, Hawthorn, Huathe, Katherine Mary Briggs, Mabinogion, Michael Cleary, Ogham, Ogham Tract, Olwen, Sidhe, Thomas the Rhymer, Tom Cowan, Tuatha De Danann, Wolf, Yspaddaden Penkawr. Bookmark the permalink.